New Commercial Potato Peelers PI: great value! We introduce a new range of stainless steel commercial potato peelers PI. Available in 3 models depending on their capacity per cycle, which ranges from 10 to 30 kg, the new PI commercial potato peeler machines are equipped with NSF-approved aluminum base plate lined with silicon carbide abrasive, easily removable for cleaning purposes. While PI-10/18 potato peeler models have chamber walls lined with abrasive, PI-30 potato peeler is equipped with lateral stirrers covered with siliconcarbide abrasive (approved by NSF). All models feature auto-drag of waste to the drain and a liftable transparent polycarbonate cover, complete with locking and safety device. The waterproof control board (IP65) offers improved reliability against moisture and water splash. All models are supplied with 0-6 min. timer with the possibility of continuous operation. PI peelers have a water inlet system with non-return air break. Model PI-30 is additionally complete with a water inlet system fitted with an electric valve. All models come equipped with an auxiliary contact for connecting an external electric valve. 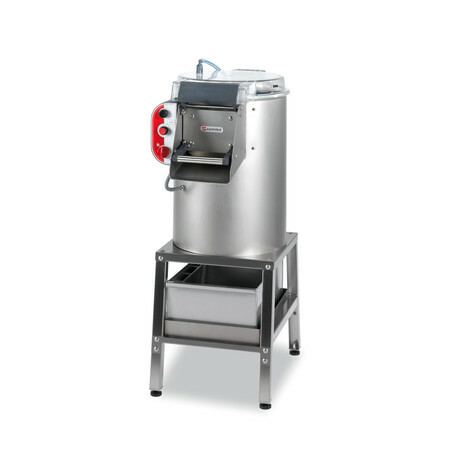 Also available in the 18 kg model, the PES-20 Potato Peeler & Salad Dryer that comes equipped with a strainer basket that allows, in addition to peeling, working as a salad dryer. Convenient option for small spaces. To suit all installations, we offer optional accessories such as stainless steel stands and filters with no-foam feature. In short, we offer the right solution for each user’s need!